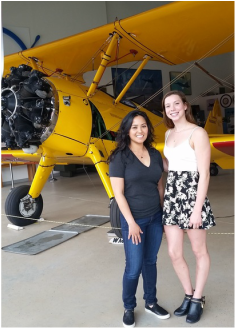 Liz works as an Electrical Engineer in the Aerospace Engineering Industry. She works for Northrop Grumman Corporation (NGC). For 75 years, NGC has pioneered the World's most advanced aircraft. NGC is an ﻿American global aerospace and defense technology company. Liz is an Engineering Manager and designs stealth parts of planes. 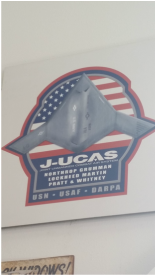 She helped to create J-UCAS, the Joint Unmanned Combat Air System, for the Navy (see photos to left). Liz attended UC Irvine for her BS in Computer Engineering and then USC for her MS in Electrical Engineering in the Electrophysics Program. She took classes in electromagnetics, computers, math, physics, circuits, propagation, calculus and statistics. Liz always knew she wanted to be an Engineer because both her parents are Chemical Engineers. Liz first wanted to work on cell phones and cameras, but then decided to work on airplanes. Liz loves Engineering because you get to work hard and problem solve. Liz is proud that she is protecting our country through her hard work and airplane designs. 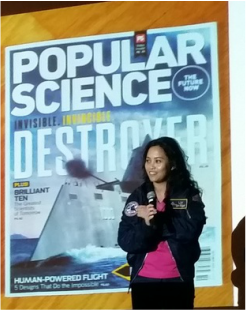 In the future, Liz would like to create more airplane designs and keep the military personnel safe.